I made the mistake of reading this book after watching the movie, and actually quite soon after. So when there were differences, I got confused, whereas when watching a movie after a book it's easy to just roll with it. So, I'm having trouble separating the book and movie in my head, in some ways. I'll start by saying, both were really good! So this will sort of be a review of both. 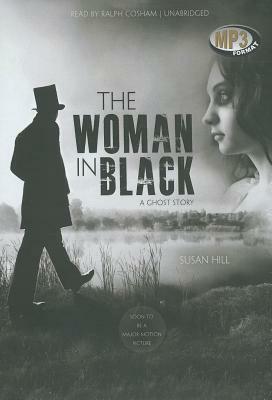 The Woman in Black tells the story of Arthur Kipps, a young lawyer from London, sent to a distant small town called Crythin Gifford to settle the affairs of a recently deceased widow named Alice Drablow. Mrs. Drablow lived in the delightfully creepy Eel Marsh House, which becomes completely cut off from the mainland at high tide. This is a great, gothic-style horror story. The atmosphere is amazing, and was captured well both by the excellent reader in the audiobook, and by the movie. The creepy house, surrounded by marsh, with mists in which you could easily lose your way and suddenly sink, the sound of a pony and trap sinking in the marshes, and a child screaming for help... it's perfect! I can't say much more without spoiling it. The ending was not what I expected. The ending is also quite a bit different between the book and the movie. I think I like the book's ending better. I do recommend both!